MELAS is an acronym for Mitochondrial encephalomyopathy, lactic acidosis, and stroke-like episodes. The end result is ischaemic damage due to presumed transient oxidative phosphorylation dysfunction within the brain parenchyma. Mutations in a particular transfer RNA gene, MT-TL1, cause more than 80 percent of all cases of MELAS. Importantly they can occur de novo or be inherited maternally. Oxidative phosphorylation (or OXPHOS in short) is the metabolic pathway which is used to reform ATP. This takes place inside mitochondria. It is highly efficient way of producing ATP. Onset is often in childhood with muscle weakness and pain. Patients may experience headaches, loss of appetite, vomiting, and seizures due to the lactic acidosis. Hemiparesis, coma, myoclonus, ataxia, hemianopia, seizures, and severe headaches resembling migraines. Ongoing weakness, altered vision, cognition. Short stature and hearing loss which is sensorineural. Behavioural and psychiatric problems are noted. Schizophrenia has been diagnosed in some patients. Elevated serum lactate. Lactic acid concentrations measured after anaerobic exercise of the forearm. CSF lactate may be elevated even when serum lactate is normal. Elevated ratio between lactate and pyruvate is high. CSF: Lactate also may be high. Lactate and pyruvate may increase substantially with exercise. Lactate/pyruvate ratio may be increased. 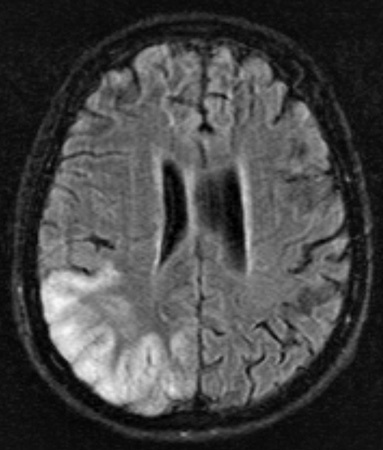 CT/MRI: Acute infarcts acute infarcts will demonstrate swollen gyri with increased T2 signal. May enhance. Subcortical white matter involved. There may be T2 shine through on DWI with little change on ADC mapping (vasogenic not cytotoxic oedema). Multifocal stroke-like cortical lesions in different stages of evolution crossing the cerebral vascular territories. There is a predilection to the posterior parietal and occipital lobes. There is basal ganglia calcification more prominent feature in older patients. MR spectroscopy may demonstrate elevated lactate in otherwise normal appearing brain. Mitochondrial DNA analysis: 80% due to mutation is at position 3243 of the nucleotide sequence and 8% are at position 3271. MELAS remains a largely untreatable condition. Manage acute medical complications may prolong survival. Progress is usually inexorable but phenotypes can vary. Coenzyme CoQ10 has been helpful in some patients with MELAS syndrome.